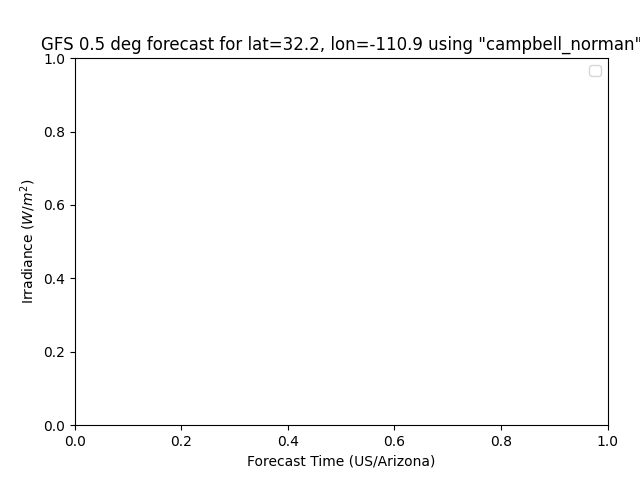 pvlib-python provides a set of functions and classes that make it easy to obtain weather forecast data and convert that data into a PV power forecast. Users can retrieve standardized weather forecast data relevant to PV power modeling from NOAA/NCEP/NWS models including the GFS, NAM, RAP, HRRR, and the NDFD. A PV power forecast can then be obtained using the weather data as inputs to the comprehensive modeling capabilities of PVLIB-Python. Standardized, open source, reference implementations of forecast methods using publicly available data may help advance the state-of-the-art of solar power forecasting. pvlib-python uses Unidata’s Siphon library to simplify access to real-time forecast data hosted on the Unidata THREDDS catalog. Siphon is great for programatic access of THREDDS data, but we also recommend using tools such as Panoply to easily browse the catalog and become more familiar with its contents. We do not know of a similarly easy way to access archives of forecast data. This document demonstrates how to use pvlib-python to create a PV power forecast using these tools. 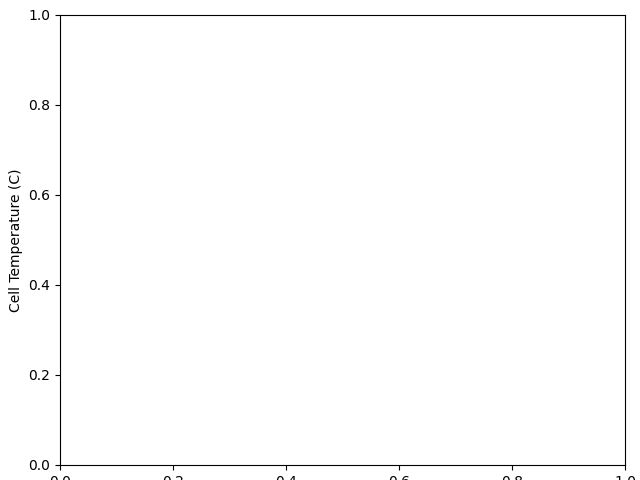 The forecast and forecast_to_power Jupyter notebooks provide additional example code. The forecast module algorithms and features are highly experimental. The API may change, the functionality may be consolidated into an io module, or the module may be separated into its own package. This documentation is difficult to reliably build on readthedocs. If you do not see images, try building the documentation on your own machine or see the notebooks linked to above. The Siphon library provides access to, among others, forecasts from the Global Forecast System (GFS), North American Model (NAM), High Resolution Rapid Refresh (HRRR), Rapid Refresh (RAP), and National Digital Forecast Database (NDFD) on a Unidata THREDDS server. Unfortunately, many of these models use different names to describe the same quantity (or a very similar one), and not all variables are present in all models. For example, on the THREDDS server, the GFS has a field named Total_cloud_cover_entire_atmosphere_Mixed_intervals_Average, while the NAM has a field named Total_cloud_cover_entire_atmosphere_single_layer, and a similar field in the HRRR is named Total_cloud_cover_entire_atmosphere. PVLIB-Python aims to simplify the access of the model fields relevant for solar power forecasts. Model data accessed with PVLIB-Python is returned as a pandas DataFrame with consistent column names: temp_air, wind_speed, total_clouds, low_clouds, mid_clouds, high_clouds, dni, dhi, ghi. To accomplish this, we use an object-oriented framework in which each weather model is represented by a class that inherits from a parent ForecastModel class. The parent ForecastModel class contains the common code for accessing and parsing the data using Siphon, while the child model-specific classes (GFS, HRRR, etc.) contain the code necessary to map and process that specific model’s data to the standardized fields. 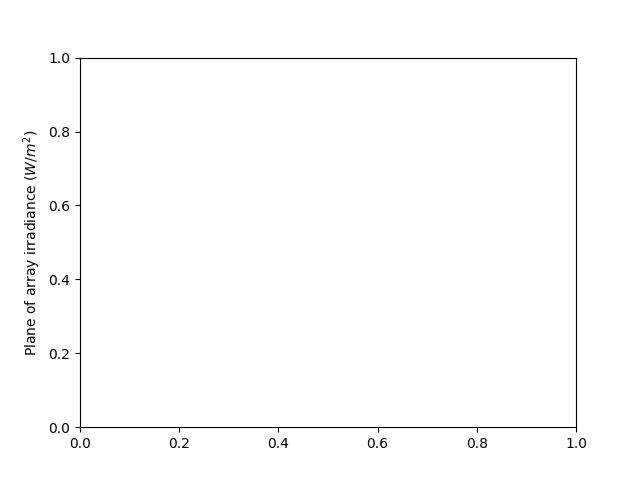 The code below demonstrates how simple it is to access and plot forecast data using PVLIB-Python. First, we set up make the basic imports and then set the location and time range data. 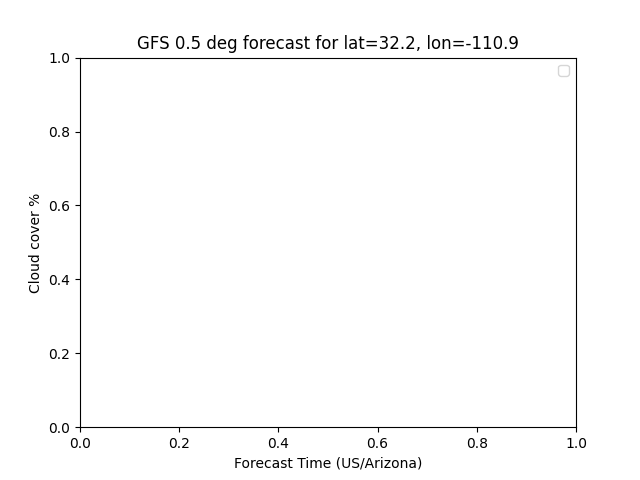 Next, we instantiate a GFS model object and get the forecast data from Unidata. It will be useful to process this data before using it with pvlib. For example, the column names are non-standard, the temperature is in Kelvin, the wind speed is broken into east/west and north/south components, and most importantly, most of the irradiance data is missing. The forecast module provides a number of methods to fix these problems. # rename the columns according the key/value pairs in model.variables. # calculate irradiance estimates from cloud cover. # uses a cloud cover to transmittance to irradiance model. 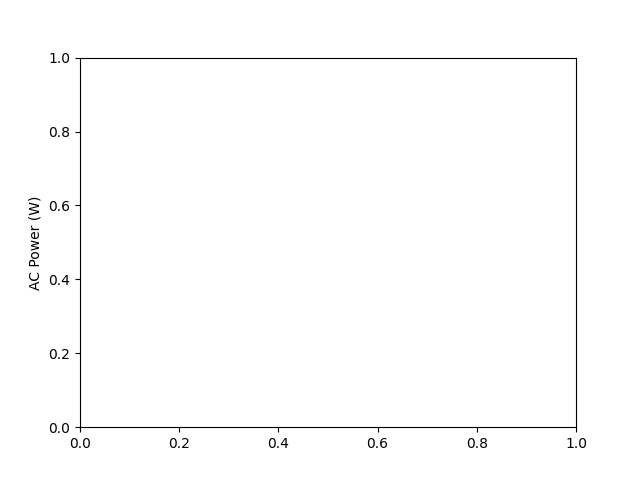 The GFS class’s process_data() method combines these steps in a single function. In fact, each forecast model class implements its own process_data method since the data from each weather model is slightly different. The process_data functions are designed to be explicit about how the data is being processed, and users are strongly encouraged to read the source code of these methods. Users can easily implement their own process_data methods on inherited classes or implement similar stand-alone functions. The forecast model classes also implement a get_processed_data() method that combines the get_data() and process_data() calls. All of the weather models currently accessible by pvlib include one or more cloud cover forecasts. 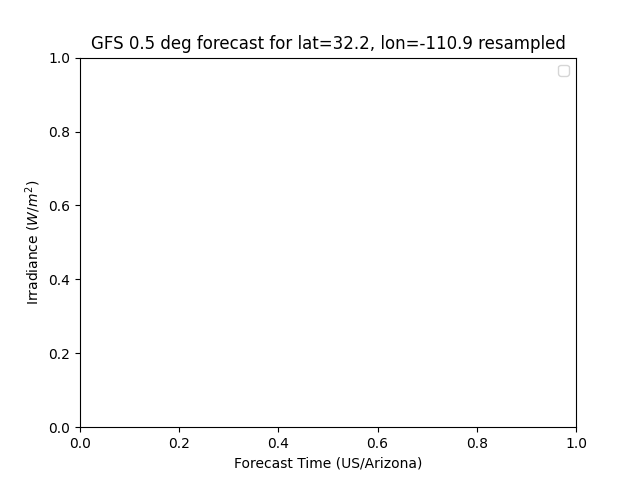 For example, below we plot the GFS cloud cover forecasts. However, many of forecast models do not include radiation components in their output fields, or if they do then the radiation fields suffer from poor solar position or radiative transfer algorithms. 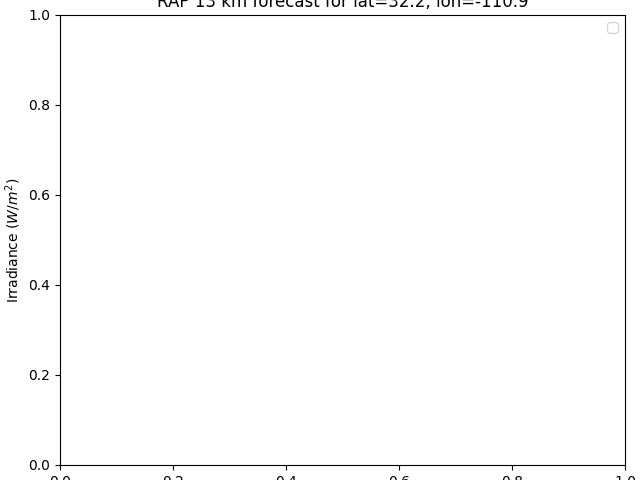 It is often more accurate to create empirically derived radiation forecasts from the weather models’ cloud cover forecasts. PVLIB-Python provides two basic ways to convert cloud cover forecasts to irradiance forecasts. 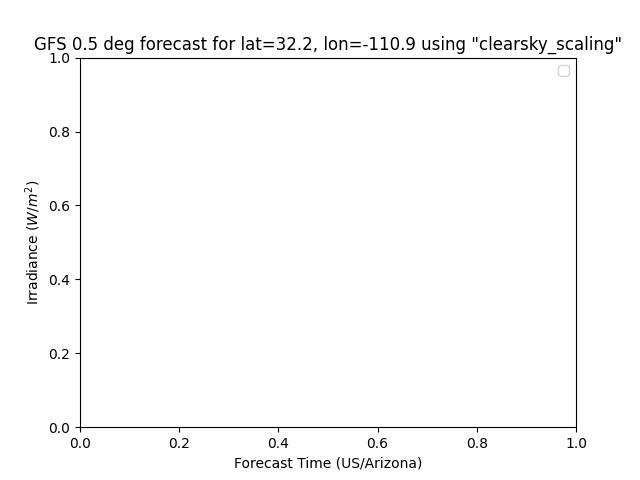 One method assumes a linear relationship between cloud cover and GHI, applies the scaling to a clear sky climatology, and then uses the DISC model to calculate DNI. The second method assumes a linear relationship between cloud cover and atmospheric transmittance, and then uses the Liu-Jordan [Liu60] model to calculate GHI, DNI, and DHI. Caveat emptor: these algorithms are not rigorously verified! The purpose of the forecast module is to provide a few exceedingly simple options for users to play with before they develop their own models. We strongly encourage pvlib users first read the source code and second to implement new cloud cover to irradiance algorithms. The essential parts of the clear sky scaling algorithm are as follows. Clear sky scaling of climatological GHI is also used in Larson et. al. [Lar16]. The figure below shows the result of the total cloud cover to irradiance conversion using the clear sky scaling algorithm. The essential parts of the Liu-Jordan cloud cover to irradiance algorithm are as follows. The figure below shows the result of the Liu-Jordan total cloud cover to irradiance conversion. Most weather model output has a fairly coarse time resolution, at least an hour. The irradiance forecasts have the same time resolution as the weather data. However, it is straightforward to interpolate the cloud cover forecasts onto a higher resolution time domain, and then recalculate the irradiance. Users may then recombine resampled_irrads and resampled_data using slicing pandas.concat() or pandas.DataFrame.join(). We reiterate that the open source code enables users to customize the model processing to their liking. Larson et. al. “Day-ahead forecasting of solar power output from photovoltaic plants in the American Southwest” Renewable Energy 91, 11-20 (2016). B. Y. Liu and R. C. Jordan, The interrelationship and characteristic distribution of direct, diffuse, and total solar radiation, Solar Energy 4, 1 (1960). Next, we provide a brief description of the weather models available to pvlib users. Note that the figures are generated when this documentation is compiled so they will vary over time. The Global Forecast System (GFS) is the US model that provides forecasts for the entire globe. The GFS is updated every 6 hours. The GFS is run at two resolutions, 0.25 deg and 0.5 deg, and is available with 3 hour time resolution. Forecasts from GFS model were shown above. Use the GFS, among others, if you want forecasts for 1-7 days or if you want forecasts for anywhere on Earth. The High Resolution Rapid Refresh (HRRR) model is perhaps the most accurate model, however, it is only available for ~15 hours. It is updated every hour and runs at 3 km resolution. The HRRR excels in severe weather situations. See the NOAA ESRL HRRR page for more information. Use the HRRR, among others, if you want forecasts for less than 24 hours. The HRRR model covers the continental United States. The Rapid Refresh (RAP) model is the parent model for the HRRR. It is updated every hour and runs at 40, 20, and 13 km resolutions. Only the 20 and 40 km resolutions are currently available in pvlib. It is also excels in severe weather situations. See the NOAA ESRL HRRR page for more information. Use the RAP, among others, if you want forecasts for less than 24 hours. The RAP model covers most of North America. The North American Mesoscale model covers, not surprisingly, North America. It is updated every 6 hours. pvlib provides access to 20 km resolution NAM data with a time horizon of up to 4 days. The National Digital Forecast Database is not a model, but rather a collection of forecasts made by National Weather Service offices across the country. It is updated every 6 hours. Use the NDFD, among others, for forecasts at all time horizons. The NDFD is available for the United States. 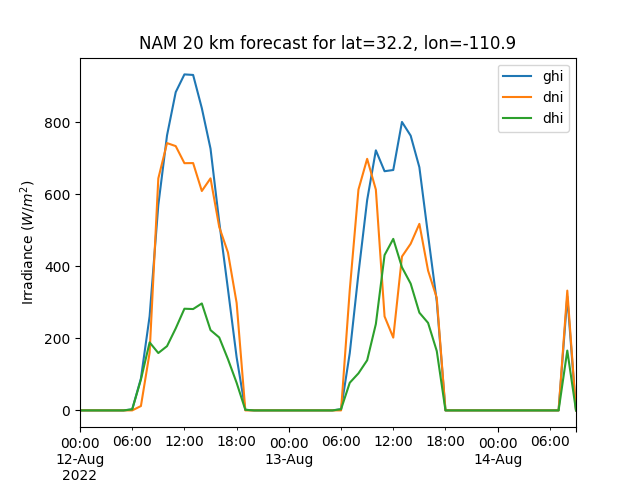 Finally, we demonstrate the application of the weather forecast data to a PV power forecast. Please see the remainder of the pvlib documentation for details.